Background: Controversies exist about the ideal sitting position. Objective: The present study compared sitting load and feet weight in ischial, sacroischial and ischiofemoral support sitting postures. Methods: Apparently healthy individuals who were asymptomatic of low-back pain for at least 6 months were recruited in the present study. Ischial, sacroischial and ischiofemoral support sitting postures were described based on literature. 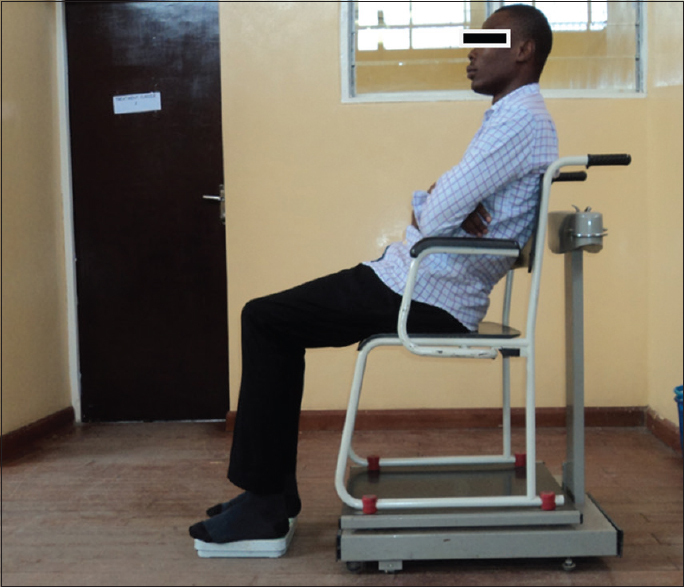 Assessment of sitting weight was carried out with a standard weighing chair, whereas a bathroom weighing scale was used to assess feet weight. Anthropometric variables were assessed following standard procedures. Data were analysed using descriptive and inferential statistics. Statistical significant level was set at P < 0.05. Results: There were 210 participants comprising 113 males and 97 females, aged 17-35 years. Sacroischial sitting weight of 51.86 (6.57) kg was the highest followed by ischiofemoral sitting weight of 49.52 (6.19) kg and ischial sitting weight of 44.87 (5.99) kg; the differences were statistically significant (P = 0.001). Similarly, ischial feet weight was 19.64 (2.49) kg, followed by ischiofemoral feet weight of 15.92 (2.08) kg and sacroischial feet weight of 12.60 (1.90) kg in sitting positions; the differences were statistically significant (P = 0.000). There was a significant correlation between sitting and feet weights in the different sitting postures and each of height, weight, body mass index (BMI) and femoral length (P < 0.05). Conclusion: The ischial sitting position had the least sitting load, whereas the feet bears the least load in sacroischial sitting. The amount of load experienced in sitting, and the corresponding feet weight was influenced by height, weight, BMI and femoral length. It is implied that sitting position with the highest amount of trunk load has the least amount of feet weight and vice versa. Although Olaogun  submitted that little can be done as regard the amount of time spent in sitting position, a good understanding of how the body weight is distributed in sitting can however serve as a basis for improving the design and construction of furniture. Previous investigators have reported that sitting weight varies with different sitting postures. ,, Increased sitting weight is implicated in increased intradiscal pressure  and increase in muscle activity , with consequent precipitation and perpetuation of low-back pain. Goldberg  recommended that the best-sitting posture with the least musculoskeletal stress is achieved with the thighs supporting the weight of the body from the ischial tuberosities to the back of the knees, with the hip joint kept at the right angle to the trunk, the legs kept at a right angle to the thigh with the feet flat and slightly apart pointing forward, the trunk is then held upright. Magee  also supported this type of sitting arguing that lordosed sitting requires too much of muscular activity. On the contrary, Sprague  advocated that lordosis at both lower thoracic and lumbar regions bring about the least muscular strain. Some other studies as well as recommended maintaining the spinal curve at a neutral position as it is when standing that is thoracic kyphosis and lumbar lordosis. , Unfortunately, there is a paucity of studies on how much of the body weight is borne on the supporting portions of the body in ischial, ischiofemoral and sacroischial support sitting postures. Olaogun  identified three basic types of sitting postures based on the body parts used for support. These are ischial anterior, ischiofemoral middle and sacroischial posterior support sitting posture. The objective of the present study was to compare sitting load and feet weight in ischial, sacroischial and ischiofemoral support sitting postures in apparently healthy individuals. The study also determined the influence of anthropometric parameters on sitting and feet weights in the different sitting postures. Apparently healthy individuals were consecutively recruited into the present study. The participants were recruited from the Obafemi Awolowo University (OAU) Campus, Obafemi Awolowo University Teaching Hospitals Complex (OAUTHC), School of Nursing, all in Ile-Ife, Nigeria. Eligibility criteria included being asymptomatic of low-back pain for at least 6 months and not having any obvious spinal deformity or neuromuscular dysfunction. The present study was carried out in the gymnasium of the Department of Physiotherapy, OAUTHC. Ethical approval for the study was obtained from the Health Research Ethics Committee of the Institute of Public Health, OAU (IPHOAU/12/29). The purpose of the research was explained to the participants and their informed consent for participation was obtained. Demographic data of the participants were obtained following the guidelines a structured pro forma designed for the study. The height of each participant was measured to the nearest 0.1 cm using a height meter calibrated from 0 to 200 cm. Participant's body weight was measured to the nearest 0.1 kg using a weighing scale calibrated from 0 to 120 kg. Body mass index (BMI) was calculated as the ratio of weight in kilograms to height in meter squared. Femoral length was measured as the distance between the anterior superior iliac spine and the tibia tuberosity using an inelastic tape measure (Butterfly Brand, China). After taking the demographic details and anthropometric measurements of the participants, the three different sitting postures were demonstrated to each participant. A weighing chair (SECA Mod. 762 1019009 CE Germany) was used to measure the sitting weights of the participants in different sitting positions to the nearest 0.1 kg. A bathroom scale (A Hanson Model, China) was placed on the floor, participants were then instructed to sit on the weighing chair with their feet placed on the weighing scale, and the sitting weight and feet weight of the participants were then taken and recorded. The sitting weight (siting load) and feet weight of the participants were thus taken in these postures. Ischial sitting posture is shown in [Figure 1]. In this sitting position, the ischial tuberosity is the major base of support. It involves sitting at the tip of the seat's platform, and the trunk is flexed anteriorly in this position. This position corresponds to what was earlier described as 'anterior sitting' by Schoberth  and then as 'slump sitting' by Claus et al. The participants were instructed to sit close to the edge of the weighing chair's platform with their feet on the bathroom scale placed on the floor with the trunk in erect position. 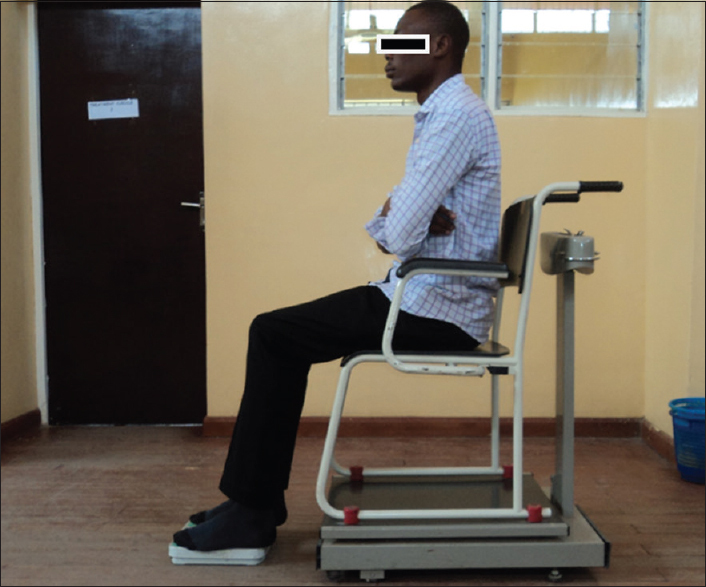 The vertical distance between the sitting platform on the chair and the floor bathroom scale was adjusted for each participant to keep the knee angle and the ankle angle at approximately 90°. The readings on the weighing scale as well as that of the weighing chair were recorded. The ischiofemoral sitting posture is shown in [Figure 2]. Ischiofemoral sitting refers to a posture in which the body is supported by the ischial tuberosity as well as the posterior aspect of the femoral region; the trunk is held erect in this posture. This is similar to what Schoberth  and Claus et al. referred to as 'middle sitting' and 'flat sitting,' respectively. The participants were instructed to sit with the buttocks and thighs occupying more than half of the weighing chair's platform with the trunk kept erect and unsupported. The readings on the scales were also noted and recorded. The knee joints were kept at 90° of flexion. [Figure 3] shows the sacroischial sitting posture. This is a relaxed form of sitting which involves reclining on the chair. In this position, the pelvis is rotated backward; hence, the ischial tuberosity together with the sacrum act as the supporting structure in this posture. Schoberth  described similar posture as posterior sitting. Similarly, Claus et al. prefer the term 'long lordosis' in describing this sitting posture. 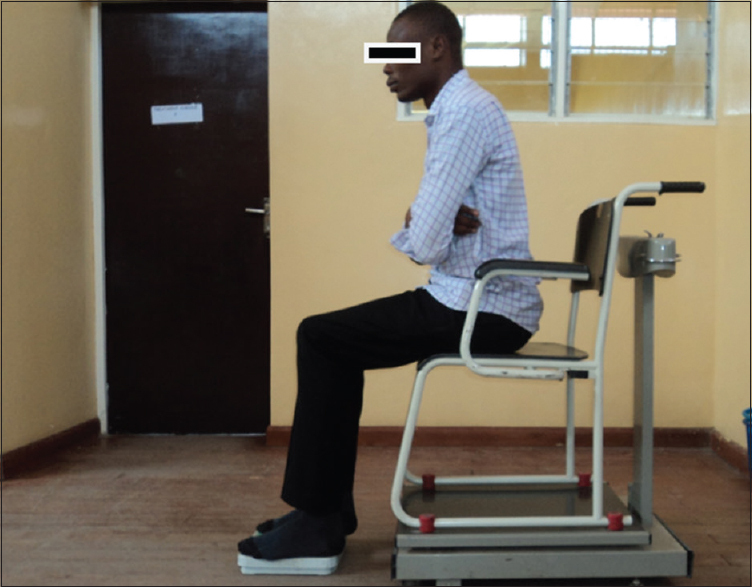 This posture was adopted by asking the participants to recline on the chair, with their feet placed on the weighing scale located on the floor, their knees were kept at 90° of flexion as well as the readings on the two scales were also noted and recorded. Data were analysed using the Statistical Package for Social Sciences (SPSS) for Windows, version 16 (SPSS Inc. Chicago, Illinois). Data were summarised using descriptive statistics of mean and standard deviation for continuous variables. Repeated measures analysis of variance (ANOVA) was used to compare sitting loads in the different sitting position. Bonferroni post hoc test was used to probe the specific difference found in the F-ratio. Pearson product-moment correlation was used to test the relationship between the anthropometric variables and sitting load and feet weights in different sitting positions. Statistically significant level was set at P < 0.05. There was a total of 210 participants comprising 113 males and 97 female, aged 17-35 years with the mean of 20.1 (2.54) years. 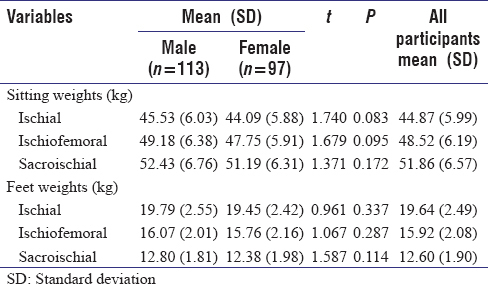 The independent t-test comparison of the participants' general characteristics between male and female participants is presented in [Table 1]. The means of heights and femoral lengths were statistically significantly higher in males than females (P = 0.001). Only the mean of BMI was higher in females than males; it was not statistically significant. [Table 2] shows the results of the sitting biomechanics of all participants and by gender. There were no significant gender differences in the sitting weights and feet weight in the different sitting positions, respectively. Repeated measures ANOVA was used to compare the sitting load of the participants in the three sitting positions as presented in [Table 3]. Sacroischial sitting weight of 51.86 (6.57) kg was the highest. This was followed by ischiofemoral sitting weight of 49.52 (6.19) kg and ischial sitting weight of 44.87 (5.99) kg. 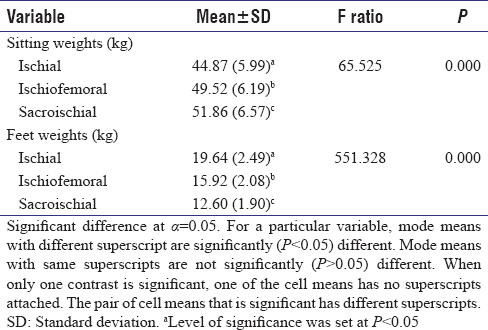 The differences were statistically significant (P = 0.000). Similarly, ischial feet weight of 19.64 (2.49) kg was the highest followed by ischiofemoral feet weight of 15.92 (2.08) kg and sacroischial feet weight of 12.60 (1.90) kg across sitting positions; the differences were statistically significant (P = 0.000). Bonferroni post hoc test analysis showed sacroischial sitting position had significantly higher sitting weight, whereas ischial sitting had the least mean score. On the other hand, ischial sitting position had the highest feet weight, whereas the sacroischial sitting position had the least mean feet weight. [Table 4] shows the Pearson product-moment correlation participants characteristics and sitting weight. 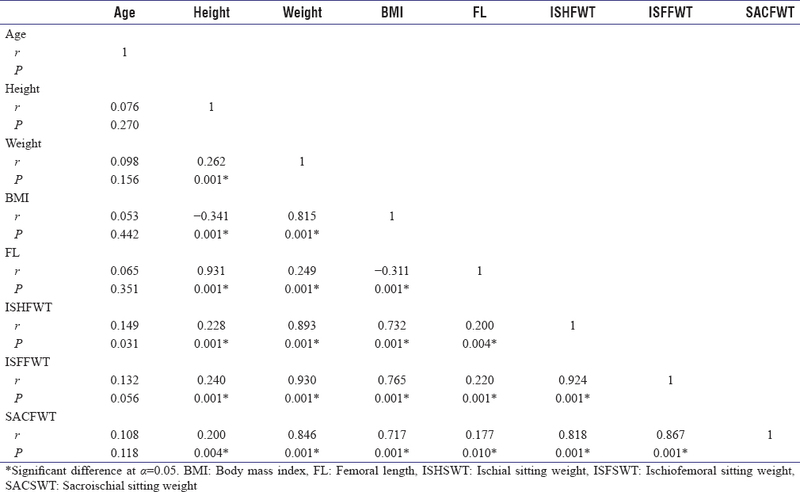 From the result indicate that there was a significant correlation between ischial sitting weight and each of height (r = 0.257; P = 0.001), weight (r = 0.977; P = 0.001), BMI (r = 0.796; P = 0.001) and femoral length (r = 0.249; P = 0.001). There was a significant correlation between ischiofemoral sitting weight and each of height (r = 0.270; P = 0.001), weight (r = 0.992; P = 0.001), BMI (r = 0.801; P = 0.001) and the femoral length (r = 0.259; P = 0.001). In addition, there was a significant correlation between sacroischial sitting weight and each of height (r = 0.269; P = 0.001), weight (r = 0.986; P = 0.001), BMI (r = 0.793; P = 0.001) and femoral length (r = 0.257; P = 0.001). [Table 5] shows the Pearson product-moment correlation participants characteristics and feet weight. 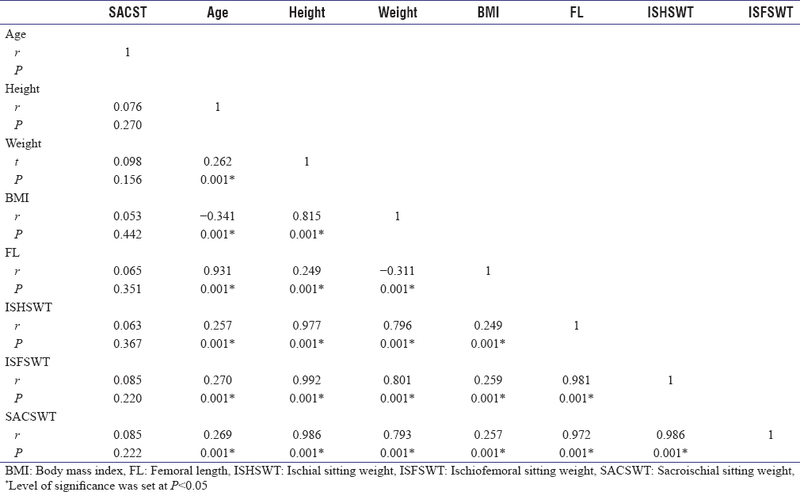 The result indicates that there was a significant correlation between ischial sitting weight and each of age (r = 0.149; P = 0.031), height (r = 0.228; P = 0.001), weight (r = 0.893; P = 0.001), BMI (r = 0.732; P = 0.001) and femoral length (r = 0.200; P = 0.004). There was a significant correlation between ischiofemoral sitting feet weight and each of height (r = 0.240; P = 0.001), weight (r = 0.930; P = 0.001), BMI (r = 0.765; P = 0.001) and femoral length (r = 0.220; P = 0.001). Furthermore, there was a significant correlation between sacroischial sitting feet weight and height (r = 0.200; P = 0.004), weight (r = 0.846; P = 0.001), BMI (r = 0717; P = 0.001) and femoral length (r = 0.177; P = 0.010). This study compared sitting load in ischial, sacroischial and ischiofemoral support sitting postures and also determined the influence of anthropometric parameters on the different sitting postures. The participants in the present study were young adults and were within the normal BMI range. Gender comparison of the participants in the present study revealed that males and females were comparable except for height and femoral length. The male participants were significantly taller with longer femoral length than the female counterparts. This finding was consistent with a report by Marras et al.,  which showed that females generally had shorter legs and longer torsos than males which significantly impact variables such as spine loading. The present study found that sitting load varied significantly in ischial, ischiofemoral and sacroischial sitting positions. More sitting load was borne in the sacroischial sitting position with the least sitting load in the ischial sitting position. The ischial sitting position, described as lordotic sitting among some authors, has been associated with increased likelihood of fatigue and discomfort than kyphotic (ischial) sitting , Furthermore, Schoberth  showed that the posterior (sacroischial) sitting had the greatest sitting load because the centre of gravity lies behind the ischial tuberosity in this position, whereas in anterior (ischial) sitting the centre of gravity is in front of the ischial tuberosity accounting for the least load in that position. Furthermore, the present study revealed that there was a significant difference in the amount of weight borne by the feet across the different sitting positions. The feet bore the greatest amount of weight in the ischial sitting position, whereas the least weight was borne on the feet in the sacroischial sitting position. Similar, to these findings, Schoberth  reported that in the anterior (ischial) sitting more than 25% of the body weight was supported by the feet and less than 25% in the posterior (sacroischial) sitting position. Overall, an inverse relationship was shown between sitting and feet weight. Specifically, a sitting position with the highest amount of trunk load has the least amount of feet weight and vice versa. Other important results from the present study showed that gender had no significant influence on sitting load and feet weight, respectively. Dunk and Callaghan  investigated gender differences in sitting postures and found that the female participants sat with more anterior rotation of the pelvis, less lumbar flexion and very little trunk flexion when compared to the male participants. Their study did not report about differences in load borne in different sitting postures. The present study investigated the influence of some selected anthropometric and demographic variables on the sitting biomechanics. The study revealed that the ages of the participants had no significant influence on either the sitting weight or the feet weight in any of the three sitting position. This was in contrast to the finding of Sato et al. that compared the spinal load at the L4/L5 intervertebral disc and revealed that participants with ageing or degenerated disc had a significantly higher intradiscal pressure compared to the healthy participants. It is adducible that the non-significant correlation between age and sitting/feet weight in this study is due to small age bracket of the sample. However, sitting/feet weight was significantly associated with height, weight, BMI and femoral length. The present study was conducted among healthy young adults; its generalizability to other populations is therefore limited. However, it is recommended that future studies should be carried out among the population with low-back pain. In addition, electromyographic studies on muscular activities of the back muscles in these three sitting positions are warranted. The ischial sitting position bore the least sitting load, whereas the feet bore the least load in sacroischial sitting. The amount of load experienced in sitting, and the corresponding feet weight was influenced by height, weight, BMI and femoral length. A sitting position with the highest amount of trunk load had the least amount of feet weight and vice versa. The authors wish to thank the African Population and Health Research Centre (APHRC), Nairobi, Kenya, for providing technical support through the African Doctoral Dissertation Research Fellowship (ADDRF) Post-Doctoral Fellowship. ADDRF is funded by the International Development and Research Centre (IDRC), Canada. Olaogun MO. Postural factors, remediation and rehabilitation of faulty postures. Health Team J 1993;8:18-20. Reinecke SM, Hazard RG, Coleman K, Pope MH. A continuous passive lumbar motion device to relieve back pain in prolonged sitting. In: Kumar S, editor. Advances in Industrial Ergonomics and Safety IV. London: Taylor and Francis; 2002. p. 971-6. Link CS, Nicholson GG, Shaddeau SA, Birch R, Gossman MR. Lumbar curvature in standing and sitting in two types of chairs: Relationship of hamstring and hip flexor muscle length. Phys Ther 1990;70:611-8. Claus AP, Hides JA, Moseley GL, Hodges PW. Is ′ideal′ sitting posture real? Measurement of spinal curves in four sitting postures. Man Ther 2009;14:404-8. Human Mobility Research Centre. Queen′s University and Kingston General Hospital Partnership. Ontario, Canada; 2002. Available from: http://www.hmrc.engineering.queensu.ca. [Last accessed on 2014 Sep 12]. Lazennec JY, Brusson A, Rousseau MA. Lumbar-pelvic-femoral balance on sitting and standing lateral radiographs. Orthop Traumatol Surg Res 2013;99 1 Suppl: S87-103. Cornell Ergonomics University Web - Ergonomics of Sitting, 2008 (DEA 3250/6510 Class Notes); 2008. Available from: http://www.ergo.human.cornell.edu. [Last accessed on 2014 Apr 12]. McKenzie RA. The lumbar spine. In: Mechanical Diagnosis and Therapy. Waikanae: Spinal Publications; 1981. p. 4-8. Frymoyer JW, Pope MH, Costanza MC, Rosen JC, Goggin JE, Wilder DG. Epidemiologic studies of low-back pain. Spine (Phila Pa 1976) 1980;5:419-23. Videman T, Nurminen M, Troup JD. 1990 volvo award in clinical sciences. Lumbar spinal pathology in cadaveric material in relation to history of back pain, occupation, and physical loading. Spine (Phila Pa 1976) 1990;15:728-40. Harrison DD, Harrison SO, Croft AC, Harrison DE, Troyanovich SJ. Sitting biomechanics. Part I: Review of the literature. J Manipulative Physiol Ther 1999;22:594-609. Andersson BJ, Ortengren R. Lumbar disc pressure and myoelectric back muscle activity during sitting 3. Studies on a wheelchair. Scand J Rehabil Med 1974;6:122-7. Frey JK, Tecklin JS. Comparison of lumbar curves when sitting on the westnofa balans multi-chair, sitting on a conventional chair, and standing. Phys Ther 1986;66:1365-9. Goldberg AG. Body Massage for the Beauty Therapist. 2 nd ed. London: Heinemann Medical Book; 1994. p. 196-20. Magee DJ. Thoracic (dorsal) spine. In: Orthopaedic Physical Assessment. 4 th ed. Philadelphia: Saunders Elsevier; 2006. p. 425-65. Sprague RB. Differential assessment and mobilisation of the cervical and thoracic spine. In: Donatelli R, Wooden MJ, editors. Orthopaedic Physical Therapy. 3 rd ed. New York: Churchill Livingstone; 2001. p. 108-43. Lee L. Restoring force closure/motor control of the thorax. In: Lee D, editor. The Thorax: An Integrated Approach. 2 nd ed., Ch. 7. Minneapolis: OPTP; 2003. p. 103-5. O′Sullivan PB. Clinical instability′ of the lumbar spine: Its pathological basis, diagnosis and conservative management. In: Boyling JD, Jull GA, editors. Grieve′s Modern Manual Therapy: The Vertebral Column. 3 rd ed. Edinburgh: Churchill Livingstone; 2004. p. 311-31. Schoberth H. Seating: Posture, injuries and furniture. Berlin: Springer Verlag; 1962. Lis AM, Black KM, Korn H, Nordin M. Association between sitting and occupational LBP. Eur Spine J 2007;16:283-98. Marras WS, Jorgensen MJ, Granata KP, Wiand B. Female and male trunk geometry: Size and prediction of the spine loading trunk muscles derived from MRI. Clin Biomech (Bristol, Avon) 2001;16:38-46. Lin F, Parthasarathy S, Taylor SJ, Pucci D, Hendrix RW, Makhsous M. Effect of different sitting postures on lung capacity, expiratory flow, and lumbar lordosis. Arch Phys Med Rehabil 2006;87:504-9. Dunk NM, Callaghan JP. Gender-based differences in postural responses to seated exposures. Clin Biomech (Bristol, Avon) 2005;20:1101-10. Sato K, Kikuchi S, Yonezawa T. In vivo intradiscal pressure measurement in healthy individuals and in patients with ongoing back problems. Spine (Phila Pa 1976) 1999;24:2468-74.